In the wake of rising cases of diseases, especially chronic diseases mainly due to lifestyle changes, it has become inevitable for patients to be monitored continuously. This has led to innovations and technological advancements in the field of patient monitoring. Wearable like smartwatches, fitness trackers, heart rate monitors, and so on, began revolutionizing patient monitoring. Non-invasive monitors have not only decreased the risk of exposure to blood-borne pathogens, but they have also made the patient’s health data available to doctors round the clock, anywhere. Today’s patient monitoring solutions are leveraging technologies such as wireless sensors, big data analytics, AI, and so on for round-the-clock monitoring of patients to deliver insights into patient health. These are also capable of enabling practitioners to monitor their patients even outside the hospital and have broadened the scope of healthcare overall. Additionally, these solutions also have the potential to lower costs, both for patients and medical institutions, and improve medical outcomes. In spite of these advantages, many healthcare providers still find it hard to leverage these advanced solutions. This is because most of these solutions are yet to be adequately integrated with existing clinical care processes, infrastructure tools. 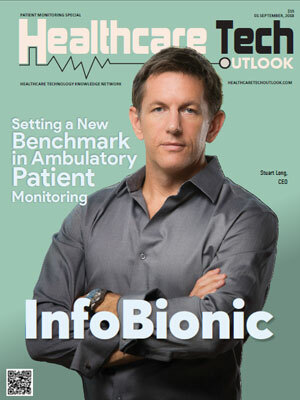 Considering these facts, a distinguished selection panel comprising CEOs, CIOs, VCs, and the Healthcare Tech Outlook’s editorial board has selected a list of the top patient monitoring solution providers that leverage innovative technologies and strategies to enhance today’s patient monitoring capabilities. We present to you Healthcare Tech Outlook’s Top 10 Patient Monitoring Solution Providers - 2018. Connected Home Living (CHL) provides remote patient monitoring (RPM) kits which include a 4G LTE tablet with over 90 prebuilt care plans for specific diagnoses and follow-ups, Bluetooth-enables medical devices such as blood pressure monitor, weight scale, and pulse oximeter. Their Remote Care Coordinators (RCC) provides face-to-face, video chat interactions with the patients to reduce readmissions while improving clinical patient outcomes. They offer services that reduce false-positive clinical escalations reducing the gap in chronic care, avoidable readmissions, and healthcare expenditures. Doctella, the patient monitroing solution company, offers a feature-rich, end-to-end application for medical practitioners to provide cloud-based RPM services to patients. The Doctella app is intuitive, interactive, secure, and HIPAA-compliant. The app monitors the patient’s physiological and non-physiological vitals such as heart rate, blood pressure, the number of steps walked, and duration of sleep through wearable devices. Doctella alerts the patient or the caregiver when the vitals cross the physician's prescribed threshold value. Additionally, Doctella empowers hospitals, practitioners, and other healthcare service companys to personalize their versions of the RPM app. HyperMed Imaging, the patient monitoring solution company, is focused on improving patient’s lives suffering from vascular disease and diabetes. The patient monitoring solutions company uses Hyperview, a self-contained imaging and analysis system which leverages the company’s patented visible light hyperspectral imaging technology to rapidly assess microcirculatory performance in superficial tissue by imaging the critical biomarkers of interest for tissue health. HyperMed’s imaging technology is more affordable than competing imaging systems that require injectable contrast. The service company remains to be the leader in the field and has over 60 issued patents and over 40 pending worldwide patents. InfoBionic, the patient monitoring solution company, offers medical devices, remote patient monitoring devices, SaaS, Cardiac Monitoring, and Cloud-based Technology. InfoBionic enables physicians in cardiac arrhythmia detection and monitoring processes with a Cloud-based remote patient monitoring platform. For remote cardiac monitoring, a small device is deployed to give physicians a real-time ECG report. The collected data syncs to a cloud platform where it can be reviewed. Settings also can be remotely adjusted according to the patient's needs. The device will automatically record and wirelessly transmit ECG data to the physician or any person attending the monitor at the hospital or clinic. This approach will reduce cardiology appointments while giving continuous medical-grade data. Omron Healthcare, the patient monitoring solution company, is a global healthcare technology company that provides a path to better living through research, industry-leading innovation, and proven educational strategies. The company designs blood pressure monitors for users in more than a hundred countries, empowering them to take charge of their health. Omron healthcare’s HeartGuide is the first-ever wristwatch that monitor’s high blood pressure, track fitness, and monitor sleep patterns. The company provides a range of fitness monitors, electrotherapy pain relief products and respiratory devices. The solutions of Omron healthcare sync with a user’s smartphone to give them a real-time reading of their health data. Reliq Health Technologies, the patient monitoring solution company, is a healthcare technology company that specializes in developing innovative remote patient monitoring systems, care collaboration, and telemedicine solutions for Community Care market. The company’s iUGO health technology platform is an extensive hardware and software solution that provides high-quality homecare. It significantly improves health outcomes, which enhances the quality of life for patients and reduces the cost of care delivery. Reliq Health’s virtual care platform offers high-quality healthcare with the use of high tech, and low touch approach, delivering solutions across the entire continuum of care. Boston Scientific is a patient monitoring solutions company dedicated to improving the health of patients around the world. The company commits to the goal of transforming lives through meaningful innovation, pursuing excellence, and collaborating with healthcare professionals. Boston Scientific uses HeartLogic Heart Failure Diagnostic system to improve heart failure management. This system enables physicians to provide proactive care to patients and reduces heart failure-related hospitalizations. The service company plans to go carbon neutral by 2030 and use renewable and cleaner energy sources. Furthermore, they ensure that diversity and inclusion is their focus and they work hard towards patient education and awareness. MD Revolution is a patient monitoring solution company. MD Resolution provides accessible care management solutions that can be customized according to the needs of the customer. The company’s care management system solutions help high-risk individuals to improve health and also prevent additional complications. The Company’s Saas solution RevUp, emphasizes behavior change for lifestyle diseases like diabetes, obesity, and heart disease. The users of RevUp receive actionable feedback based on personal health data collected by wearables and apps. Using Predictive analytics, individuals who can or cannot achieve desired health outcomes are identified. This data is used by clinicians and health coaches to focus on particular participants who require more intensive coaching. Meditronic, the patient monitoring solution company, is the world’s largest medical device company. The businesses of the company primarily fall into four categories, which are: Cardiac and Vascular Group (CVG), Restorative Therapies Group (RTG), Diabetes Group, and Minimally invasive Therapies Group (MITG). The company provides an efficient patient monitoring system for various healthcare solutions. The CVG includes areas like cardiac rhythm and heart failure, coronary, structural heart etc. The RTG encompasses biologics, surgical technologies, neuromodulation, etc. The diabetes group covers areas like Insulin Pump Therapy, and Continuous Glucose Monitoring Systems. The MITG offers solutions for Advanced Surgical Technologies and General Surgical Products, medical supplies, respiratory and monitoring solutions. ReliantHeart, the patient monitoring solution company, is a prominent innovator in mechanical circulatory support therapies and patient monitor systems to address advanced-stage heart failure. The company manufactures aVAD, an innovative Ventricular assist device (VAD). The aVAD which is the world’s first fully remotely monitored VAD, is an implantable electric pump for patients who require ventricular due to end-stage heart failure. The aVAD offers many exclusive features such as Flow Accurate Diagnostics, HeartAssistRemote Monitoring, and INR Tracking. It also provides an efficient patient monitoring system by accurately measuring the blood flow, speed, and power, alerting healthcare professionals to any potential issues.